Using a paint sprayer can make a huge difference in any painting project, but it can easily cause a lot of complications and safety hazards if used incorrectly. Here’s what you need to know about paint sprayer safety, so you can use one effectively without harming yourself or those around you. 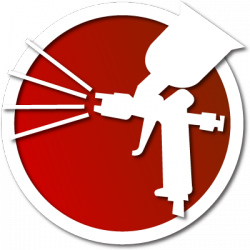 Every paint sprayer is different, even when focusing on a specific class of tools like airless sprayers. It’s incredibly important to spend some time becoming familiar with your model before you start to use it, so that you can be aware of all potential issues and safety features. Generally speaking, airless paint sprayers are safer to use for those with less experience than compressed air sprayers, since air compressors can be incredibly dangerous if used incorrectly. If you have any concerns about your own ability or the safety of you and your crew, it may be best to stick with airless sprayers. Regardless of what type of paint sprayer you choose, you must ensure that you have the proper ventilation in your work area so that you don’t inadvertently inhale harmful paint fumes. Interior paint jobs may require you to open windows and doors, while most outdoor work will have plenty of ventilation. If you are working in a shop setting, such as with automotive painting, you may need to set up external filters or use a mask to protect yourself. All paint sprayers require a power source to operate, so you should make sure you understand the needs of the sprayer and the condition of the circuitry in your location. Most paint sprayers will function on a standard 110 volt outlet, with many requiring outlets that have a grounding fault. If you are going to work in an area with old two-prong outlets, you should establish an external power source for optimum safety. Also, air compressors may carry different power requirements, depending on the capacity and model, so make sure that you can safely operate the compressor on the available circuits and in that area before you begin to use it with a paint gun. Taking the time to properly clean your paint sprayer after each use is key to ensuring safe operation in the future, since leftover paint residue can lead to more than just poor performance. In airless sprayers, the paint can make its way into the internal turbine, which could cause a short circuit. For compressed air sprayers, paint buildup can prevent the even flow of air, which could cause a rupture or broken seal that would release the compressed air in unexpected ways. Remember that most compounds you would use in a paint sprayer are flammable (with the exception of some water-based paints), so remember that you should never spray near any open flames or exposed live wires.